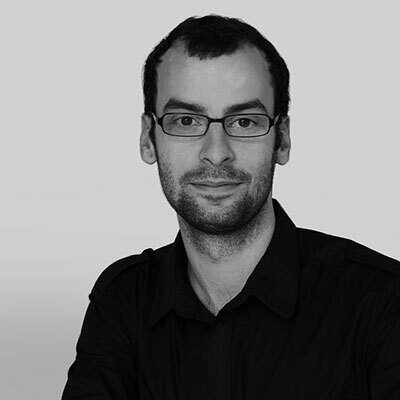 Nicolas Markwald is – together with Nina Neusitzer – a director of design agency Markwald Neusitzer Identity, based in Frankfurt am Main and Düsseldorf. After completing his studies at the University of Wuppertal, he worked in the field of digital media at various design bureaux in Hamburg, Berlin and Frankfurt. He is a member of the Type Directors Club of New York, the D&AD (Design & Art Direction) in London, and the DDC (Deutscher Designer Club), Frankfurt am Main. Mark­wald Neusitzer Iden­ti­ty is a design agency in Frank­furt am Main and Düs­sel­dorf that focus­es on cor­po­rate design. For more than ten years, it has been pro­vid­ing cor­po­rate iden­ti­ty and indi­vid­ual com­mu­ni­ca­tions solu­tions for major com­pa­nies and cul­tur­al insti­tu­tions in dig­i­tal and ana­logue media. Clients include the Deutsche Oper am Rhein, the Bal­lett am Rhein Düs­sel­dorf Duis­burg, Salon – the Salzburg Festival’s art and cul­ture mag­a­zine, the Schirn Kun­sthalle in Frank­furt, the Haus der Geschichte der Bun­desre­pub­lik Deutsch­land, and Hein­rich Wilke GmbH. The bureau has received numer­ous inter­na­tion­al awards for cor­po­rate com­mu­ni­ca­tion and com­mu­ni­ca­tion design.